The award validates extensive, thoughtful work and a multi-year process by Webster faculty to redesign the general education curriculum to better meet 21st-century students’ needs. Umbaugh said that designing was only half the battle; fitting the program across a university with five schools and colleges and campuses on four continents required the work of many. But that also enabled part of the program’s beauty: The key outcomes of the program can be incorporated into courses designed by any Webster school or major. 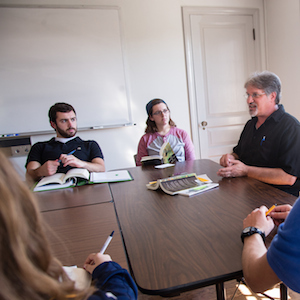 Webster first began offering a general education program in 1994, but it wasn’t until 2009 when members of the faculty decided to overhaul the program so that it better aligned with Webster’s mission and the changes resulted in the Global Citizenship Program. The program now aims to arm students with the skills of Critical Thinking, Ethical Reasoning, Intercultural Competence, Oral Communication, Quantitative Literacy, Written Communication, Integrative Learning and Teamwork and with broad knowledge of human cultures and the physical and natural world. Judges said, “The AGLS Awards Committee voted unanimously to recognize Webster. . . They appreciated the strong connections drawn between the new Global Citizenship Program and Webster’s international mission." successful -- and quick -- redesign and implementation. Umbaugh said that the support of the administration and faculty helped the program to be successful – and relatively quickly, too. From the outset, they sought to create a set of undergraduate degree requirements and a general education program to help prepare students to confront global problems and 21st century challenges. In 2009 Umbaugh led a small team to learn more about best practices in teaching general education courses, about curricular models, and about how to approach the process. They proposed to the Faculty Senate that a complete reworking of the undergraduate general education program should take place, and the Senate initiated the process that summer. To complete the Global Citizenship Program, students take two seminars, the First-year Seminar as new students and the Global Keystone Seminar as juniors. In addition, students complete eight courses of at least three credit hours each in the general education portion of their program. But the work continues, Umbaugh said, as improvements are always being made. In addition to improvements on assessment, Umbaugh would like to help improve communication about the program to students and the committee will be holding open office hours in the University Center and in East Academic Building to answer questions and address students’ concerns. He hopes that this award encourages faculty to spread awareness of the program through their own work. The Exemplary Program Awards have been given since 2007. Previously recognized institutions include James Madison University, Portland State University, Miami Dade College, and the Chinese University (Hong Kong). More information on Webster University’s GCP can be found on our website.